The Public Works Department is composed of nine (9) divisions: Engineering, Facilities Maintenance, Fleet Maintenance, Streets, Cemetery, Sanitation, Water and Wastewater. The department’s responsibilities include Public Works engineering, building and custodial maintenance, street maintenance, vehicle and equipment maintenance, water supply, water distribution, wastewater collection and treatment, transportation, engineering, and development reviews. Our field staff work in harsh conditions, such as the summer heat, monsoon thunderstorms, and the cold of winter. They are some of the first to be called out to set up barricades, repair water distribution systems, maintain wastewater collection systems, and clean our streets when nature plays havoc with us. The administrative and technical staff are involved in the construction, management and administration of Capital Improvement Projects involving public works infrastructure. For further information about this department or any questions that you may have, please contact any of our staff. Please see the images below for the road closures. The oil and rock will be laid down on Tuesday, April 2nd followed by a fog seal on Wednesday April 3rd. 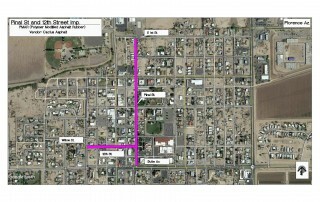 For information or questions please contact Dan Cisco, Streets Superintendent at 520-868-7642. The mission of the Facility Maintenance Division is to provide, protect, and maintain the Town of Florence’s physical assets, such as buildings, properties, equipment, and to ensure a safe working environment in a cost-effective manner for its employees and citizens. The Facility Maintenance staff is comprised of custodial services and maintenance personnel. The maintenance staff provides services to most of the town-owned/occupied buildings. Maintenance activities involve carpentry, plumbing, masonry, heating, and air conditioning repair. Our custodial staff and maintenance crew maintains a total of 142,767 sq. ft. The mission of the Fleet Maintenance Division is to provide and maintain vehicles and equipment in support of the Town of Florence’s various departments and divisions. Our goal and commitment is to do this in a proficient, professional, and courteous manner. The Fleet Maintenance Division is responsible for the maintenance and repair of most of the equipment and vehicles of the Town of Florence. The division has a full-service maintenance shop with six (6) equipped bays. Our staff insures that proper maintenance is performed for equipment longevity and safety. Services are provided for the Senior Center, Streets, Cemetery, Sanitation, Police, Facility Maintenance, Administration, and Water/Wastewater. The Fire Department and the Parks and Recreation Department provide their own vehicular and equipment maintenance. The Streets Division is responsible for the upkeep and maintenance of our town streets, drainage facilities, traffic control devices, and public rights-of-way. Our primary duties are described as follows: grading shoulders and unpaved roads, filling potholes, chip sealing, weed control and tree trimming in rights-of-way, drainage channel cleaning, maintaining streets and alleyways, cleaning and sweeping debris and litter from paved streets, providing emergency storm and flood protection, overseeing street projects, crack sealing, and sidewalk repair. The functions described above are to provide the motoring public and transportation industry with a road and bridge system which is protected, preserved, and well-maintained in order to maximize infrastructure life at minimum long-term cost, and to ensure a safe and efficient transportation system, as per Town Code and statutes. The Public Works Superintendent focuses on our extensive street pavement maintenance program by using varying degrees of repair, construction, and installation. Because of the wide spectrum of services that we provide the Town of Florence, we are required to employ people with a wide scope of skills, talent, and equipment. Being armed with this level of proficiency tends to make our division the target for an even greater variety of requests. wastewater plants. Measures such as Bio-Dredge (agent used in feeding organisms that eat odor-causing bacteria), masking agents, and chlorinated water are used to help control odor in the collection system. Some of the short-term goals include sewer line maintenance, continued line upgrades, sewer line extensions (based on annexation), upgrading of equipment, and continued training for staff. One of the major goals for the Florence Wastewater Division is building a new Wastewater Plant. In the event of an after-hours emergency, you can call the Police Department to have our on-call personnel dispatched. 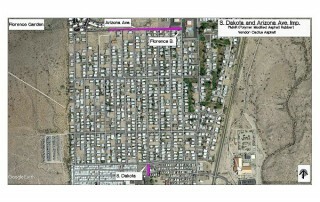 The town has two (2) water systems. Each of these systems can run independently of one another. The water systems have a total of six (6) wells, along with a 2.5 million gallon water storage capacity. They service an average of 2,650 meters. Each day, our staff conducts a number of regulatory tests and analytical processes to ensure the safety and quality of our drinking water. Some of the short-term goals include upgrading main lines, adding more storage tanks, acquiring more wells, and continued training for staff. One of the main goals is to always maintain the best potable water possible. In order to insure this, water quality assurance tests are performed on a monthly, quarterly, and yearly basis. 2. Once the form is filled out, you can email, fax, mail or take the form to Town Hall.